Playland's Castaway Cove at 10th & The Boardwalk in Ocean City offer over 30 rides for the whole family to enjoy including the ‘Double Shot’, which was known as the "Best Amusement Ride" at the shore by Atlantic City Magazine. They also feature 3 roller coasters, including Ocean City's only looping coaster, Python, in addition to a Tilt-A-Whirl, bumper cars, antique cars, old-fashioned train and log flume ride. Come and create happy moments. 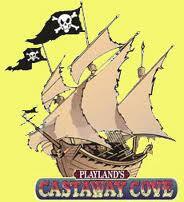 Note to our visitors Playland’s Castaway Cove coupons and specials can change without notice. So please visit their official website to make sure of the latest pricing and coupons.